Neo-soul has returned with a futuristic twist and Hiatus Kaiyote is leading the movement. Hiatus Kaiyote, a quartet from Melbourne, Australia, played two sold-out shows in Los Angeles this past weekend as part of its world tour for its new album, “Choose Your Weapon.” To make matters more exciting, the group chose the El Rey Theatre, a decently sized venue lined with red carpet – yes, even on the walls – and intricate glass chandeliers. The act, well known for bringing back neo-soul from the late 1990s, includes vocalist and guitarist Nai Palm and band members Paul Bender, Simon Mavin and Perrin Moss. It’s been two years since Hiatus Kaiyote released an album, and “Choose Your Weapon” has come as a gift to all of us. Its 2013 album, “Tawk Tomahawk,” is what caught my eye, but the new album seems to pave the way for a new style of funky rhythmic shifts with hints of punk rock instrumentals. In the midst of a trendy crowd, all dressed in forms of vintage fringe and New Member jackets, Knxwledge opened up the show with hip-hop remixes of tracks by Kendrick Lamar and Dr. Dre. You heard that right. Knxwledge, the opener for this year’s Bruin Bash that wasn’t too well received, opened for Hiatus Kaiyote. I laughed to myself at the coincidence and couldn’t help but roll my eyes in memory of how poorly the crowd received his opening act. This crowd seemed to agree as they responded with some side conversations and yawns. Queen Magic, another opener, took over to perform some of his songs that have been trending on Soundcloud. The crowd loved Queen Magic, especially when he brought out an interpretive dancer for his last song. It was unexpected and that’s exactly what the crowd needed. After almost two hours of openers and a pair of numb feet, the crowd was greeted by Hiatus Kaiyote with “Choose Your Weapon,” enticing the crowd with the band’s idiosyncratic keyboard drift and gritty bass. The song, filled with diverse grooves and electronic additives, sounded like the beginning of a ’90s video game but to many it was a preview of the wild journey the night was about to become. In between songs, Nai Palm explained that Japanese anime influenced many of her songs, especially “Laputa.” In this particular song, Hiatus Kaiyote demonstrated something nostalgic in that the band brought back the slow easy drifts, a technique the group based its last album off of. The swaying crowd basked in the purple stage lights. For those five minutes, the El Rey seemed to be at peace. The quartet then switched up the mood with “Breathing Underwater,” a musical tribute to Stevie Wonder, allowing Palm to display her incredibly talented guitar solos. The band flipped the tempo playfully throughout the track, making it easy to spot the shoulder-dancers in the crowd who weren’t familiar with the song. “Prince Minikid” and “Jekyll,” two songs that spotlight the Afro-beat ballads and intense funk vibes, were recent additions to the lineup. The new songs on this album definitely strayed away from classic neo-soul and distinguished themselves individually with a splash of funky, spooky, orchestral and rhythmic concord. Hearing “Molasses,” one of the album’s most decorative songs, sent exhilarating chills down my back; it was almost terrifying to feel the bass vibrating in my bones accompanied by Palm’s silky voice. The crowd loved “Molasses” – we attempted to sing along, but quickly realized that we couldn’t keep up with Palm’s next-level voice. 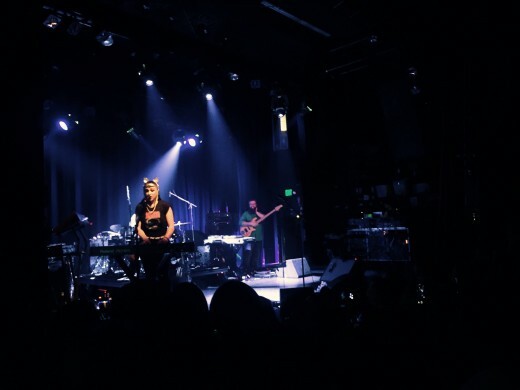 For $40, Hiatus Kaiyote provided an A-plus night to old and new listeners not only with an excellent execution of their musical charisma but also with the group’s humility, as Palm was constantly thanking the crowd. My favorite song “Fingerprints” wasn’t performed, but I guess that’s just another excuse for me to catch them at Hiatus Kaiyote’s next American tour.